Breakfast Club Poker: Dutch's Legacy? 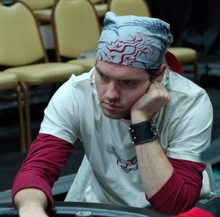 In an alternate universe, Dutch Boyd would be best remembered for winning his first WSOP bracelet, battling heads-up against the reigning WSOP Champion Joe Hachem and taking home the spoils in the 2006 Short Handed event. But that is not the universe reflected in the online forums this week. While most online players couldn't tell you what they ate for breakfast or the last bad beat they put on someone, they all seem to remember some version of the Pokerspot.com debacle that still appears to dog Russ "Dutch" Boyd. Judging from the recent posts, anybody that lost their bankroll when the Boyd-owned online poker site imploded back in 2001 is taking their angst to the grave. It's a long sordid story, but those with stronger stomachs than mine can check out some of the historical posts , later historical posts, and current posts.